"Well, well ... if it ain't the Limbo Kid." I used this cartoon in my recent talk at the Summer Squall arts festival as an example when talking about how to come up with ideas. People often think that ideas arrive out of the blue, in some kind of lightbulb moment. That can happen, of course, but it can't be relied on. You have to generate ideas. Clearly this is a bit of an off-the-wall cartoon, so how did I arrive at the idea? Firstly, while staring at that blank piece of paper you can just give yourself a subject. So I decided I wanted to do a cowboys cartoon, as they're fun to draw. That got me thinking about the clichéd saloon door entrance that we've all seen in westerns and I wondered if there could be another way for a cowboy to make an entrance. 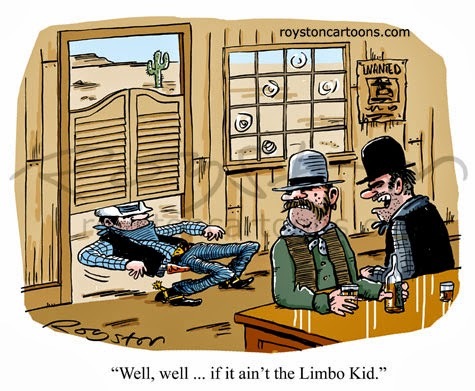 I could have drawn him jumping, maybe pole-vaulting, over the saloon doors and that may have led to another cartoon. Instead I started to sketch him going underneath and it occurred to me that he could limbo dance under. While I was drawing that, the phrase "the Limbo Kid" came to me. That was the lightbulb moment but, as you can see, it took some time to arrive at that point. The cartoon appears in the October issue of Reader's Digest. 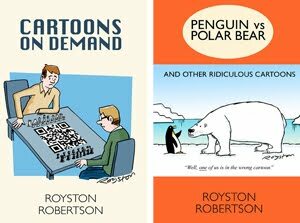 One of my drawings is also in this issue's Beat the Cartoonist contest. So if you can come up with a better idea than me you can win £100 and the original drawing. Click here for details on how to enter.